Already dreading those first football and skipping games at school and the inevitable scuffs on brand new school shoes? Panic no more, we have it all sorted. We went to see the shoe polish company FAMACO in France. They are known for their quality products and have an answer to any leather related problem! It has been several years now that we are stockist of their shoe creams and 'miracle' colour dyes. You will now find ALL the matching colours for your children's shoes from Menthe et Grenadine. The colour repair dye is brilliant to re-dye scuffed areas and give the leather its colour back. 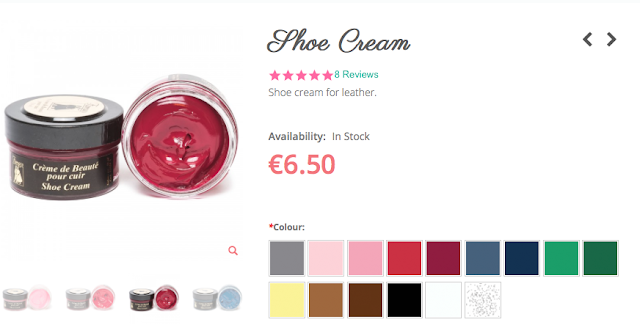 And the shoe cream is a must to nourish and polish the whole shoe in the matching colour- for a shiny finish. You will not believe it until you try it, but the shoes will look as good as new!